NewsOK of Oklahoma published this great article about the birds of the Rio Grande Valley on May 2015. The tremendous natural resources the Valley has attracts thousands of visitors and journalists to the area every year. Articles like these help us let the word out, and we wanted to share with our readers, so they consider planning a visit to one of the many nature parks in our area. McALLEN, Texas — Snow birds in recreational vehicles flock from the north, migratory birds wing their way from every direction, and the locals offer first-class cultural, retail and culinary options to further attract visitors to the Rio Grande Valley. It’s the No. 1 bird-watching destination in North America, with birders contributing $400 million a year to the economy, said Nancy Millar, vice president and director of the McAllen Convention and Visitors Bureau. Millar’s favorite is the green jay, which sports a blue and black head, yellow tail and lime-green body. It’s a Central and South American bird that has made its way to south Texas and, like the other 38 species, is typically seen nowhere else in the United States. One way to learn about birds is to buy books and go to websites, and there are some good ones. But it’s more fun to learn from the rangers and other experts at the nine World Birding Centers in the valley. First lesson: if you want to find a bird, look for its habitat. Certain birds like certain trees, and seeds, and insects. Some need a bigger puddle of water than others. Seclusion matters more to some than others. Available nesting materials make a difference. It’s worth the trouble to call ahead and ask for a guided tour at places like the Bentsen-Rio Grande Valley State Park in nearby Mission. You will pick up tons of knowledge about the climate, the ecosystem, terrain and the vegetation — and you’ll see some birds. In fact, ranger Javier Deleon said, “It’s the laziest birding in the valley.” That’s because the park provides feeding stations during certain months of the year, and the hungry birds long ago learned to ignore the people who gawk at them. Lots of birders cross “life birds” off their lists at Bentsen-Rio Grande, meaning it’s the first time they’ve seen that bird. 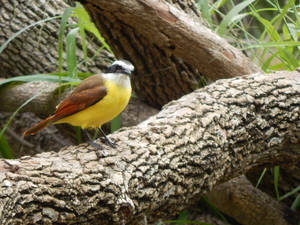 Among the easier birds to spot are the altamira oriole, the great kiskadee, the chachalaca, the buff-bellied hummingbird and the orange-crowned warbler. Volunteers help keep the park’s 11 feeding stations filled, often trading their labors for a free RV parking spot. Sue Whitman, of Austin, said she and her husband, Steve, started birding 14 years ago and made some trips to the valley. They now spend October and November as interpretive park hosts, parking their RV behind the administration building. They work only 20 hours a week, “which gives us time to explore the area,” Sue Whitman said. Park ranger Roy Rodriquez, always happy to answer questions, offered tips on attracting hummingbirds to one’s own backyard. Hummingbirds are territorial, he said, so it’s best to have two or three feeders instead of just one, which the birds will fight over. Instead of red liquid, use a red-colored feeder to attract the birds, Rodriquez said. Mockingbirds, white-winged doves, orioles and the great-tailed grackle are among birds that find sanctuary at Quinta Mazatlan, a world birding center in McAllen. The name means country estate, and the city bought the hacienda from private owners in 1998, later purchasing adjoining properties. The habitat is as beautiful as the birds, and the city’s focus has been to restore native vegetation to the 17-acre grounds where 39 species unique to the valley have been recorded, many of which live there year-round. Green and ringed kingfishers, great blue and black crowned herons, snowy egret, the long-billed thrasher and the vermilion flycatcher find homes in the trees that ring the ponds at the Edinburg Scenic Wetlands and World Birding Center. The 40-acre city-owned refuge also offers butterfly and dragonfly habitat, an interpretive center and more than three miles of walking trails. Nearly 400 species of birds have been spotted on the 2,088-acre Santa Ana National Wildlife Refuge in Alamo, which is along the southernmost stretch of the Rio Grande River. The Mississippi and Central flyways converge there, and the inviting habitat includes Spanish moss, prickly pear cacti and a subtropical thorn forest. Waterbirds, songbirds and birds of prey co-exist in this jewel of biodiversity, as do half of all the butterfly species in North America. We spotted a pair of indigo snakes from our tram, a sight that delighted even the rangers who roam the refuge every day. If you want to meet a happy man, seek out park ranger John Yochum at Estero Llano Grande State Park in Weslaco. He no longer has to bear the winters in Ohio, and he gets to work on a 250-acre refuge that shelters 30 species of birds typically seen nowhere else in North America. He even gets to rub shoulders with Benton Basham, one of the founders of the American Birding Association who lives in Tennessee but spends his winters volunteering in the valley. At Estero Llano Grande you might see the endangered wood stork, the roseate spoonbill, the rare red-crowned parrot or the green parakeet.